Katch Kan, a leader in safety and environmental protection equipment, will be presenting the company’s vacuums with the recently launched Gen2 Game Changer Automated Vacuum at Adipec. 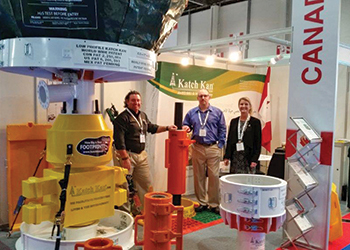 The Edmonton-headquartered Katch Kan is looking forward to raise awareness at the show of new solutions and innovative technology available to prevent spillage and contamination. The company’s solutions not only help firms improve their social corporate responsibility and licence to operate but also help them save money avoiding costly cleanups and providing time and mud saving during the drilling process, says Maria Politti, marketing manager, Katch Kan.
Katch Kan has been exhibiting at Adipec for the past four years. Every year the show seems to have more exhibitors and more delegates. The atmosphere is appropriate to build relationships and hold business meetings with top executives. "Last year hundreds of visitors stopped by Katch Kan’s booth to learn more about our Rig Safety System (RSS) and Zero Spill System (ZSS). An important number of leads and business discussions were accomplished with regional companies. Some of those discussions led to big projects that are still under development," she says. The company works with oil and gas companies and drilling contractors to ensure access to tangible, efficient, safe and proactive solutions to prevent the loss of drilling fluids and the contamination of drilling sites and workover sites. The central achievements of Katch Kan are the RSS and ZSS, she says. RSS is designed to increase personnel safety while decreasing operational hazard on a rig-floor. The patented ZSS not only captures fluids but assists in the prevention of the need to go fishing for dropped foreign objects, thereby reducing down time and loss of production. The innovation of the ZSS leads to less water usage, less trucking and emissions; a huge return on investment for the oil company. RSS and ZSS when used together capture lost drilling fluid, and redirect the lost fluids to be recycled or reused. Katch Kan builds these systems under ISO 9001 and 14001 management systems. The company operated a full service field operation in Canada under COR (Certificate of Recognition) guidelines. The product lines include fluid containment system, safety and ergonomic mats, wide range of industrial vacuums for offshore and onshore rigs, variety of trays and other safety products like tong handle guards for example, she explains. Referring to the market situation, she says: "We have seen a notable decrease in the number of rigs operating in North America over the past year as energy prices collapsed with the consequent impact. However our international markets kept almost the same pace, especially the Middle East region. Oil and gas companies are operating on tight budgets and one of the reasons they are choosing our solutions is because they cut the daily rig rate cost by reusing expensive drilling fluids and reducing the drilling time." For more than 20 years Katch Kan has been a leader in safety and environmental protection equipment. With the company’s products in place an oil company can be transparent about its operations, knowing it is taking the right measures for a sustainable development and ensure its social licence is secure. Katch Kan provides solutions and services for land, offshore, workover rigs and production wellheads, says Politti. "We expanded our operations in the Middle East in early 2015 with the opening of our regional office in Bahrain. The Bahrain office offers sales, rental and service to operators and drilling contractors in the region and enables the company to provide additional comprehensive service and support to our regional customers," she says. Katch Kan Bahrain and its UAE distributor Al Mazroui mobilised in August to install the industry leading ZSS for containment of the underbalanced segment on the exploratory well in the Emirate of Umm Al Quwain. Additionally the company has delivered the first of two orders of its complete package RSS and ZSS to Saipem for its first two Kuwait rigs that will be spudding for Kuwait Oil Company later this year. Besides, earlier this year Katch Kan accomplished several projects in Saudi Arabia, UAE, Kuwait, Oman, Qatar and Bahrain. Katch Kan is currently in negotiations with a supply chain and warehousing specialist located in Jafza to improve its lead time and increase its regional stock to better serve its customers. Additionally the company is developing projects in other areas of the industry across all GCC states for the Kan Electric Vacuum series focusing on but not limited to the offshore marine sector. Katch Kan is an award-winning company recognised for its contributions to the industry. Last December Katch Kan received the Alberta Export Awards: Manufacturing category. These prestigious awards pay tribute to the success and innovative approaches of Alberta export companies and Katch Kan Ltd was recognised among them, she says.